A few years ago I worked for the VA hospital in Tucson, Arizona, driving disabled vets to and from medical appointments. Most of the patients I worked with used wheelchairs or mobility scooters, and the VA had strict procedures for transporting them safely in our handicap-accessible vans. 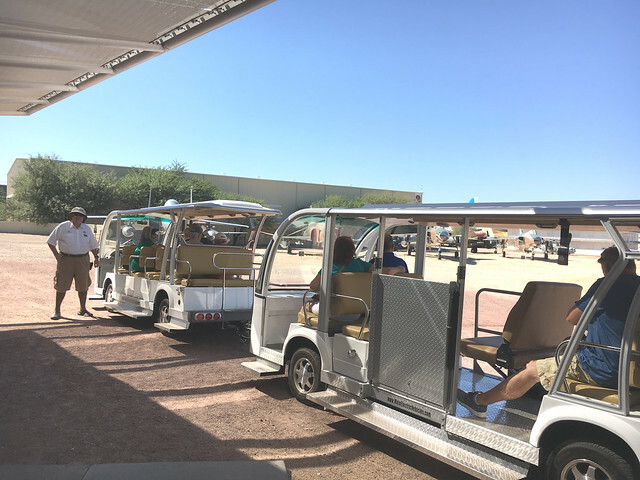 I bring up this ancient history because among my duties as a volunteer tram tour driver at Pima Air and Space Museum is carrying the occasional handicapped guest in a specially-equipped tram. Our handicap-accessible tram has a wheelchair ramp and an enclosed area large enough to accommodate one passenger, with safety rails, anchor points on the floor, and straps to secure the chair or scooter. When I started volunteering on the trams, I was shown how to work the ramp and straps, as were my fellow volunteer drivers. Beyond that, though, there hasn’t been much guidance … very unlike the VA. Admissions told us we’d have a wheelchair guest for yesterday’s 3 PM tram tour, which I was scheduled to conduct. When I pulled up to the loading area in our handicap-accessible tram, a vehicle we rarely use because it has limited seating for other guests, two other volunteers were waiting for me. Before I even set the brake and got out of the driver’s seat they’d unfolded the ramp and pushed the guest aboard. I grabbed the straps to secure the seat, but the handicapped guest’s son, a healthy-looking man in his 30s, was already helping his dad get out of the wheelchair and into a regular seat. The son then folded the wheelchair and handed it back to us, so there was no need to strap it down. We folded the ramp back up and left the wheelchair at the loading area. Something about the way we handled that bugged me, but I suppressed the thought and once the other guests were on board started the tour. The other volunteers had left for the day when the tour was over, but I had expected that and was ready unload the wheelchair guest on my own. As I stopped the tram, the son jumped off and grabbed the wheelchair. By the time I unfolded and lowered the ramp he’d already helped his dad get up from the regular seat and back onto the wheelchair. He started to push his dad forward toward the ramp but I stopped him and told him to turn around so that he (the son) would come down the ramp first, walking backward, with his dad in the wheelchair in front of him, facing uphill. Thank goodness I had the sense to do that, at least. With the downward slope of the ramp, dad would have slid right out of the seat and onto his face. But I wasn’t out of the woods yet! With the son halfway down the ramp and his dad at the top, almost two feet above the ground, the son slipped and our wheelchair guest, chair and all, nearly went over the side! I was right there and was able to grab the chair as the son regained his footing. We recovered and the guest and his son went on their way as I folded up the ramp. My experiences driving disabled vets for the VA came rushing back. I’d done literally everything wrong, and that was what had been bugging me earlier. The driver must personally load and unload the wheelchair passenger, never allowing family or friends to assist. The wheelchair guest must remain in the wheelchair, properly secured, for the entire trip, and not attempt to get out of it and into a regular seat. VA drivers before me had learned that those are the two areas where most slipping, tripping, and falling accidents happened. Friends and family, if they were around, would try to help load and unload wheelchair passengers. Passengers themselves would often try to get out of their wheelchairs once onboard and move to a regular seat. There was nothing abstract about it, either … I saw both things happen, over and over, during my time with the VA. It was up to me to stay in charge, prevent either thing from happening, and ensure the passenger’s safety. So there I was at the museum yesterday, standing by like a dumbass and letting both things happen, with nearly disastrous results. It won’t happen again, at least not with me. When I got home I sent a message to our boss suggesting we adopt both VA handicapped passenger policies, along with a suggestion we conduct formal training for all volunteer tram drivers, because we really haven’t had any and every driver’s doing his own thing. I may be the only volunteer tram driver at the museum with actual wheelchair passenger experience, and I hope they’ll listen to me.